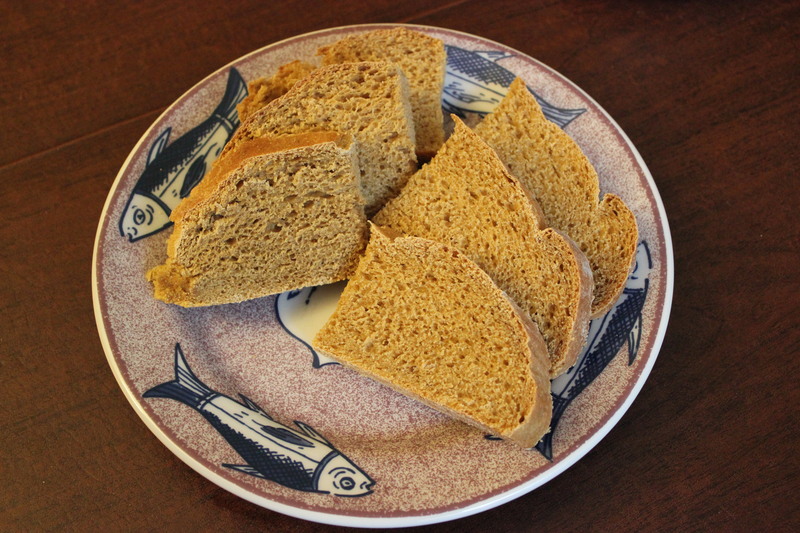 Whether created by a colonial settler, who added flavorful indigenous ingredients to an English yeast bread, or by a post-Revolutionary housewife, in a community whose cuisine harked back to seventeenth-century English cooking, Anadama bread embodies the fierce local pride and deep English roots of the North Shore of Boston. 1. In a large bowl, gently whisk the yeast in the warm water and let stand for about 10 minutes. 2. Beat in the cornmeal, molasses, butter, and salt. Mix in the flour, one cup at a time, blending well after each addition, to make a moderately stiff dough. 3. Turn the dough out onto a lightly floured surface and knead for 6 to 8 minutes, until smooth and elastic; add a little flour if necessary to prevent sticking. 4. 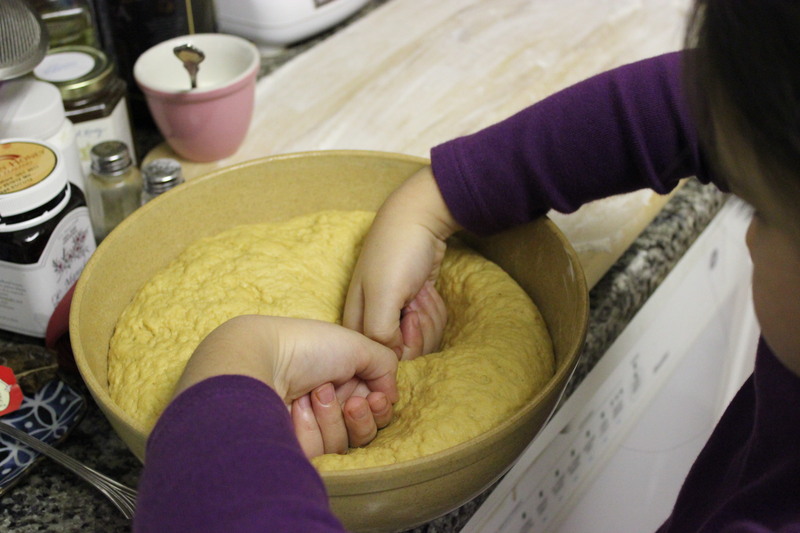 Transfer the dough to a large bowl lightly coated with vegetable oil, and turn the dough to coat with the oil. Cover with a slightly damp towel and let rise in a warm, draft-free location for 1 to 1 1/2 hours, until approximately doubled in size. 5. Punch down the dough. This is a good job for kids, if you have any lying around saying they’re bored. Turn the dough out onto a lightly floured surface and divide it in half. Cover, and let rest for 10-15 minutes. 6. Lightly grease a very large baking sheet with butter, then sprinkle with cornmeal. Shape each half of the dough into a ball. Place the balls, smooth sides up, on the baking sheet. Flatten each into a 6-inch round loaf. Cover with towel and let rise for 30 to 45 minutes, until almost doubled in size. Meanwhile, preheat the oven to 375°F. 7. Bake for 25 to 30 minutes, until the bread is golden and sounds hollow when tapped on the bottom. Remove the bread from the baking pan and cool on wire rack. Serve warm if possible. 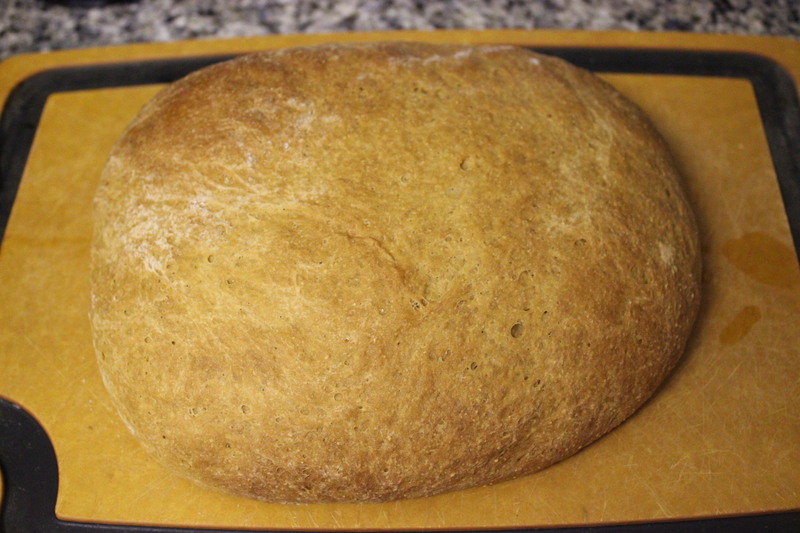 This entry was posted in breads and tagged anadama, baking, Bread, Cape Ann, cornmeal, Molasses by revolutionarypie. Bookmark the permalink. Hello, having recently eaten at City Tavern where I great enjoyed the Anadama bread after only just learning of it, I’m curious how the recipe in The City Tavern Cookbook is different from your slight adaptation. Will you please tell me? Hi Ken, I have also had the Anadama bread at City Tavern — it’s wonderful! I made very few, very minor changes to Staib’s recipe (thus the “slightly adapted” instead of “adapted”) and several were just clarifications — I specified coarse yellow cornmeal and dark molasses, and I suggested a slightly longer first rise. I also recommended vegetable oil instead of butter or vegetable spray to coat the bowl. I really recommend the City Tavern Cookbook and Staib’s newer dessert book, Sweet Taste of History. Thanks very much, Karen! Since I was so impressed by the taste of the bread, I look forward to trying your recipe.